This is an implementation of a simple SOCKS5 Proxying connection (RFC 1928 + RFC 1929). Make sure to pass the proxy host/port to the transport connection (ConnectionTCP in this case), and the XMPP host/port to the proxy connection. 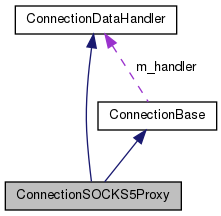 The reason why ConnectionSOCKS5Proxy doesn't manage its own ConnectionTCP is that it allows it to be used with other transports (like IPv6 or chained HTTP/SOCKS5 proxies). This class is also used by the SOCKS5 bytestreams implementation (with slightly different semantics). Simple plain-text username/password authentication is supported. GSSAPI authentication is not supported. Definition at line 53 of file connectionsocks5proxy.h. Constructs a new ConnectionSOCKS5Proxy object. connection A transport connection. It should be configured to connect to the proxy host and port, not to the (XMPP) host. ConnectionSOCKS5Proxy will own the transport connection and delete it in its destructor. logInstance The log target. Obtain it from ClientBase::logInstance(). server A server to connect to. This is the XMPP server's address, not the proxy. port The proxy's port to connect to. This is the (XMPP) server's port, not the proxy's. The default of -1 means that SRV records will be used to find out about the actual host:port. ip Indicates whether server is an IP address (true) or a host name (false). To properly use this object, you have to set a ConnectionDataHandler using registerConnectionDataHandler(). This is not necessary if this object is part of a 'connection chain', e.g. with ConnectionHTTPProxy. Definition at line 46 of file connectionsocks5proxy.cpp. cdh A ConnectionDataHandler-derived object that will handle incoming data. Definition at line 58 of file connectionsocks5proxy.cpp. Definition at line 71 of file connectionsocks5proxy.cpp. This function is called after a disconnect to clean up internal state. It is also called by ConnectionBase's destructor. Definition at line 143 of file connectionsocks5proxy.cpp. Used to initiate the connection. Definition at line 91 of file connectionsocks5proxy.cpp. Disconnects an established connection. NOOP if no active connection exists. Definition at line 103 of file connectionsocks5proxy.cpp. totalIn The total number of bytes received. totalOut The total number of bytes sent. Definition at line 152 of file connectionsocks5proxy.cpp. Definition at line 331 of file connectionsocks5proxy.cpp. Definition at line 371 of file connectionsocks5proxy.cpp. Definition at line 163 of file connectionsocks5proxy.cpp. This function returns a new instance of the current ConnectionBase-derived object. The idea is to be able to 'clone' ConnectionBase-derived objects without knowing of what type they are exactly. Definition at line 77 of file connectionsocks5proxy.cpp. Use this function to put the connection into 'receive mode', i.e. this function returns only when the connection is terminated. Returns a value indicating the disconnection reason. Definition at line 118 of file connectionsocks5proxy.cpp. Use this periodically to receive data from the socket and to feed the parser. timeout The timeout to use for select in microseconds. Default of -1 means blocking. Definition at line 110 of file connectionsocks5proxy.cpp. Use this function to send a string of data over the wire. The function returns only after all data has been sent. True if the data has been sent (no guarantee of receipt), false in case of an error. Definition at line 126 of file connectionsocks5proxy.cpp. Sets the underlying transport connection. A possibly existing connection will be deleted. connection The ConnectionBase to replace the current connection, if any. Definition at line 83 of file connectionsocks5proxy.cpp. user The user name to use for proxy authorization. password The password to use for proxy authorization. Definition at line 142 of file connectionsocks5proxy.h. Sets the server to proxy to. host The server hostname (IP address). port The server port. The default of -1 means that SRV records will be used to find out about the actual host:port. ip Indicates whether host is an IP address (true) or a host name (false). Definition at line 134 of file connectionsocks5proxy.h.